The prolific actor reprises her role as a CIA agent on the NBC drama tonight. 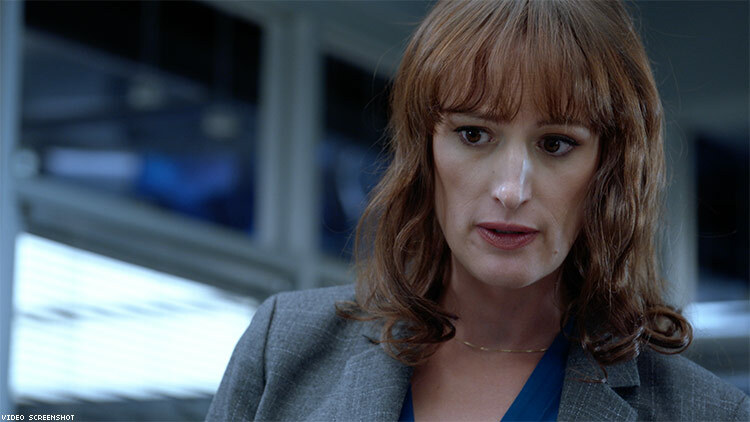 Jen Richards, the prolific out transgender actor, is playing a cisgender character in NBC's popular drama series Blindspot. The show follows the story of Jane Doe (Jaimie Alexander), a woman who was found in Times Square with no memory of how she got there. With only the clues of mysterious tattoos on her body, she begins to piece her life together, and a web of crime and conspiracy unravels. Richards reprises her role as hard-hitting CIA agent Sabrina Larren in a new episode airing tonight. Richards has played a recurring transgender character on Nashville, but a trans actor playing a cisgender character is still something rare. She has spoken out for trans actresses in Hollywood and called out the problems of "transface," or cisgender actors playing trans roles. Her work acting in and co-executive producing the Emmy-nominated web series Her Story, about the dating lives of two transgender women, helped sparked early conversations about transgender stories and lives. Watch an exclusive clip of Jen Richards as CIA agent Sabrina Larren telling Reade (Rob Brown) that he needs to hand Zapata (Audrey Esparza) over to CIA custody. The new episode of Blindspot featuring Jen Richards airs tonight at 8 on NBC.